Students and staff at Liberty Tree Elementary School assembled in the gymnasium Friday afternoon, supposedly to hear from a motivational speaker. But instead they were surprised to learn about State Superintendent of Public Instruction Paolo DeMaria’s new favorite hero. No, not a traditional superhero such as Superman. Although DeMaria pulled a Clark Kent and changed into a new outfit: a plaid shirt and a distinct pair of spectacles. “I’m going to dress up like that hero,” DeMaria said. “One of the great things we get to do at the State Department of Education is to pick one tremendous teacher to be the Teacher of the Year. Mr. J, as Jonathan Juravich is known, is Liberty Tree Elementary School’s art teacher. And Juravich is the 2018 Ohio Teacher of the Year. Students and staff cheered for their mentor and colleague. Juravich, Liberty Tree Principal Terri Caton, the secretarial staff, and music teacher were the only ones at the school who knew about the recognition. Juravich found out about the news three weeks ago. At the time, DeMaria impersonated a newspaper reporter to interview Juravich over the phone under the pretense of him being one of the five finalists for the award and Teacher of the Year for State Board of Education District 6. Juravich said he had different “wave of emotions” came over him when DeMaria finally told him the news. He thanked several people including his family, colleagues, students, former teachers, and the district for receiving the award. According to Olentangy Local Schools board of education member Julie Feasel, Juravich is the first art teacher and first teacher from Olentangy to be honored as state teacher of the year. She tweeted that information Friday afternoon. In 2005, Juravich graduated from Otterbein University with an art teaching certificate and joined the Olentangy Local School District. Since then, he has traveled between four different elementary schools until he became a permanent art teacher at Liberty Tree in 2007. He then drives to Otterbein for a weekly course to instruct future art teachers about elementary and secondary art education in the fall and spring. In addition, Juravich often collaborates with the Columbus Zoo and Aquarium. Activities include ZooTeen art camps, consultations, and being a guest artist at events. Some activities involve having armadillos, snakes, penguins, and turtles walk across a painted canvas. Juravich said it’s a way to bring conservation into the discussion. Jonathan Juravich, second from the right, holds his certificate for being 2018 Ohio Teacher of the Year. He stands next to his wife, Amy Juravich, and their daughter Josie, while Ohio State Superintedent Paul DeMaria speaks Friday at Olentangy Liberty Tree Elementary School. Juravich teaches art at the school. 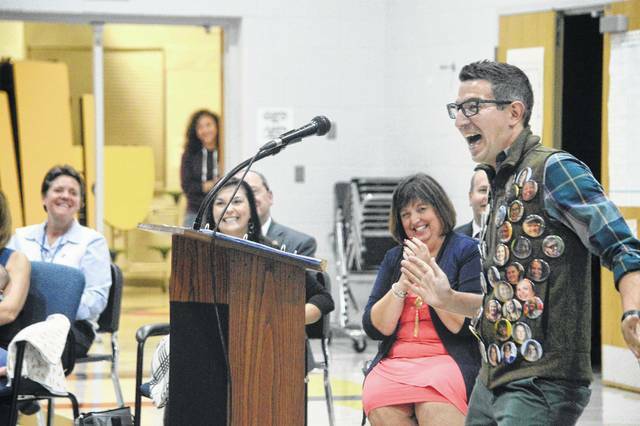 Jonathan Juravich, art teacher at Olentangy Liberty Tree Elementary School, talks to his students in an assembly after being honored as the 2018 Ohio Teacher of the Year. Juravich showed a vest of buttons with the faces of his colleagues at the school. He makes buttons as prizes for students.